Everything you love about pumpkin pie, made into a light and fluffy dip. Perfect for dipping apple wedges, graham crackers or gingersnaps. This one’s an oldie from the archives. I made it on Halloween to bring to a friends and figured I’d revive it from the archives for those of you who haven’t tried it. It’s a great dip/dessert to bring to a party, and would also be great for Thanksgiving. Mix pumpkin with brown sugar, vanilla and spices, blend well. 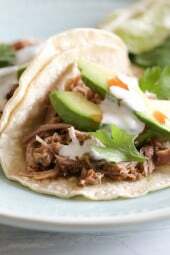 Fold in Truwhip and chill in refrigerator until ready to eat. Did anyone dip the apple slices in lemon juice to prevent browning? I made this ALL THE TIME for parties in the fall and people LOVE IT!! I serve with vanilla wafer cookies and apple slices. You would never know this was a light version of regular pumpkin dip. So delicious! Do you think I could use a dairy free cream cheese like Daiya or Tofutti and Cocowhip? We can’t do dairy and really want a few yummy options for turkey day!! I haven’t tried it, let me know if you do! Can this be made the night before ? Or should it be served right away? The night before would be OK.
Is there another recipe or has this one been changed? I made this last year and liked it better. Help! Do you use the truwhip frozen or thawed to mix in?! Can this be frozen for later use? I want to make this next week for a get together. Can I substitute cool whip (fat free) for Truwhip? Thanks! I have some leftover pumpkin pie dip. Anyone have a recipe to convert it to pumpkin bars or pumpkin bread?? Any suggestions? I made this for our Thanksgiving gathering last night and it was a huge hit! Thank you ever so much. I make this recipe ALL THE TIME! It's my go-to for a quick and sweet dip. It's always a favorite wherever I take it and people are always shocked by how lowfat it is! Even my in-laws like it (4 years of cooking for them, and this is the only recipe they've liked, and they request I bring it with me every Thanksgiving). It's definitely a keeper! When you mix the truwhip, is it frozen or thawed? I made this for a bbq and it was delicious! I love how light & airy it is! This is delicious. So light and flavorful! Is it pumpkin puree or pumpkin pie filling? Did you ever get an answer….I was wondering the same thing. Love this site!! I made this because I love all things pumpkin. I used the Splenda Brown sugar mix. It was delicious with apple slices. I also had it on brown toast for breakfast. 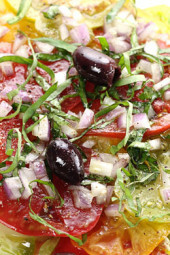 Hi Gina – Another great recipe. I can't wait to try this – I think it'll be a great addition to some of the snacks for Thanksgiving. Just one question though and honestly, I doubt this'll be a problem. But, how long will this keep for? I made this for a halloween party 2 weeks ago and actually put it in a cleaned out pumpkin! people were raving about it (and wanting to bathe in it!) Thanks! If this isn't consumed the day it's made, does it keep for a few days if refrigerated in an air tight container? Hi-has anyone tried this with a sugar substitute? I quit sugar 6 weeks ago and am now ready to start looking for sweet options. I have Truvia in my cupboard, wondered if I could use that? It looks like the perfect treat! Gina, if I made this using homemade whipped cream, how long would it hold up? Could I make it in the morning and serve it for dessert our take it to a football gathering in the afternoon? I don't think it would hold up that long, you could make everything, then whip up the cream just before serving. Where can I find Truwhip??? Target, and many supermarkets carry it. Do you use pumpkin puree? Hi Gina! This looks AMAZING. ;9 I'm living abroad currently and don't think I can get my hands on any cool whip. Do you have any suggestions for diet-friendly substitutions? Hi Gina! I had some of this left over that we weren't going to get to in time, so I froze it. What an incredible yummy pumpkin ice cream!! 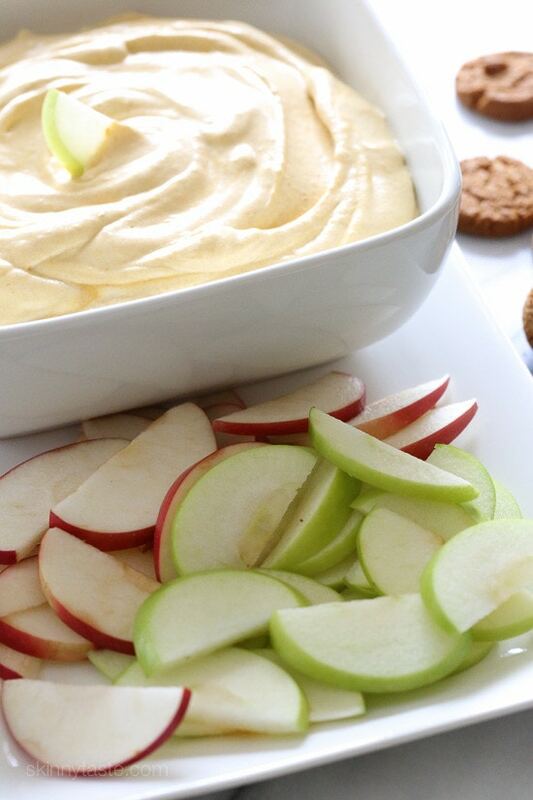 This dip was perfect for dipping green apples and cookies! (I made the pumpkin snickerdoodle cookies from this site) I doubled the recipe for a party, and everyone loved it! Made this last night – threw in a bit more cinnamon by taste, but followed the recipe exactly other than that. Delicious! Great food to snack on during tv – dipped with apples and grapes. Made this after midnight for my college student who is home for Thanksgiving but is studying for finals and will be up very late. The dip with apples hits the hunger spot!! Thanks for sharing all the ideas. Any ideas on how to make this without the yogurt or cool whip? I love the idea of it but have a dairy allergy. I made this for Halloween party at work. Every one enjoyed it. I did find the truwhip at Whole Foods and used that instead of cool whip. I actaully cut out alot of the sugar and it was sweet enough for every one here. I used a 1T of sugar/stevia mix then about 3T of brown sugar. We ate it w/preztel crisp and back to nature oat graham crackers. It was the perfect. Thank you again for the site. I have fallen in love with it! Made this for my church group yesterday, huge hit! I couldn't stop eating it myself. MUST try with apples. I had this at a get together on Saturday. It is so good! I can't wait to take this to a Thanksgiving dinner! Question…is it vanilla extract that you use? Is the yogurt plain or vanilla? I wasn't sure when I made it and used plain, it tasted a bit too tangy. Has anyone used vanilla? Hope to try it again with better results. I had a craving for something sweet, so I indulged a little and ate this dip with Nilla wafers…….it was like a creamy yummy pumpkin pie. I think I may make some mini sandwiches with the leftovers and try freezing for an ice cream sandwich redo. Made this last week for a work pitch in. It was a HUGE hit. I used Splenda brown sugar. Served with apples and graham crackers. Making this again! THIS IS AMAZING! I made it last night; for a special treat for my 1 year old I let her dunk graham crackers in the dip. I also tried putting some dip inbetween grahamm crackers and freezing them…OMG DELISH! Pumpkin pie fro yo sandwiches!!! Wow! That looks so yummy! Thank you for all of your great recipes and ideas. We are very new to gluten-free at my house. This dip is absolutely AMAZING Gina! I'm obsessed with your site, and this is one of my favorites because it's so light and great with fruit. Thank you!! I was just going to ask the same question! I just made the pumpkin butter yesterday and am looking for ways to use it up!! Hi Gina I was wondering if you could use your pumpkin butter in this rather than the canned pumpkin and spices? Would the points be the same? I served the leftovers tonight. Froze them in a pie crust and called it frozen pumpkin cheesecake", everone in the family loved it! This s awesome!! Even my somewhat picky husband liked it! I will definitely be making the throughout the fall. Thank you for posting delicious WW recipes!! I made this yesterday as a snack for work with apples. It was so A-mazing! My coworkers loved it too! Thank you so much for making healthy recipes that taste good! You're a pioneer! I just found your site and I have been on it for hours! I HATE yogurt but had to try this recipe based off of the reviews. It is AMAZING. I used Splenda brown sugar which takes the calories down even more. The only "con" in my opinion is how much this recipe makes. I divided it by 3 and hope it lasts a few days. I'm trying your garlic shrimp and coconut cilantro rice for dinner tonight. LOVE LOVE LOVE your site! This dip is WONDERFUL! A good summer dish rather than making a whole pumpkin pie. Thank you so much! If I use vanilla Greek yogurt instead of plain should I leave out the additional vanilla? Finally one that doesnt use fat-packed cream cheese, the easy way out! I was hoping it would stiffen over night but no such luck. I enjoyed a few servings with Wasa crackers and one with green apples. I had so much of it that I took it to our weekly game night with friends (they ate it with light graham crackers) and the general consensus was that it wasn't bad but it wasn't good, either. Kind of bland and just a weird consistency. In the future I think I'll have to try a fat free cream cheese based dip instead. I made this dip this evening and I'm not sure exactly what I did differently, but mine came out to be a lot less calories. I used dark brown sugar (its all I had) and fage greek yogurt (our store didn't have the kind that you used). Are dark brown sugar and regular brown sugar different in calories and so on? I adore pumpkin and WI is finally returning to some chilly spring weather so I have my built in "fall treat" excuse. I accidentally over softened the cool whip so I lost some creaminess/consistency. It could use something to make it stiffer. I upped the spicing but overall it is great and I can't wait to try it as a snack tomorrow! I am heading to my son's school, his pre-k class does cooking each week with recipes that match the letter of the alphabet they are learning and they ask parents to come in and demo a recipe. This week's letter is P and I can't wait to make this with them 🙂 This is by far, my most often used skinnytaste recipe! I just pinned this. My hubby would so love this! Commercial canned pumpkin is often Butternut squash rather than pumpkin. If you don't have canned pumpkin you can easily substitute an equal amount of Butternut squash (baked is easiest) or even mashed up baked sweet potato. I generally use them interchangably. It's the spices that give you the traditional pumpkin pie/dessert flavor rather than which ever sweet orange vegetable puree you use. Sometimes the homemade pumpkin substitutes are a bit fibrous or lumpy. This is easily solved by using a blender and any other wet ingredient that maybe needed in the recipe. Whirl is all together until you have a nice smooth texture. My new stick blender is my best friend for this task. Cool whip is a non dairy whip cream using hydrogenated oil. Truwhip is similar but no hydrogenated oils. Both are in the freezer section of the grocer. Making your own whip cream, from heavy cream is the alturnitive but it won’t be a skinny recipe! Maybe you can use Redi Whip, which is whip cream in a can sold in the refridgerated area. I made this last night & had a little & then brought it to work today for a luncheon we were having. I wanted to make sure I had a WW-friendly dessert. OMG, this is so, so good. I had it with apples, grapes & a few graham crackers. All delicious. I'm thinking of freezing some on top of some graham crackers to make it kind of like a frozen pie. Oh yum. I can't wait to make this again. Yum, I made this for an apple and graham cracker dip as suggested. However, I'd like to add that it's also delicious atop dark chocolate brownies!!! Made this for the appetizer table at our family get together. Along with the apples, some of my family members dipped in marshmallows. The women seemed to like it more than the men. I thought a little of this between graham crackers and then frozen would be a nice cool treat. I made this dip for work and it was a huge hit. It is so easy to make and tasty. Everyone that tries this dip RAVES about it!! I made it for a work function and I found people attacking it with spoons, lol.. The first scoop of a fresh batch is enough to make your eyes roll back in your head. It's THAT GOOD!!! It's a good thing I have an extra can of pumpkin and Cool Whip Free at the house. I made this to take tomorrow to be sure I had a good snack. I don't know if it will last till then. Thanks Gina, it's YUMMY!!!!! Amazing – served to hubby last night with apple slices. Didn't say a thing to him and he was all over it! 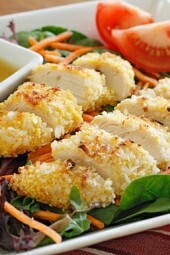 This is yet another of your recipes that will have a reoccurring place in my cooking! I made this for a work pot luck and it was a huge hit. My personal favorite was to eat it with gingersnaps. I know it isn't as low on points but it was sure worth it to me. Thank you! My cousin makes a version of this and uses leaf/fall themed small cookie cutters to cut out pieces of Pillsbury pie crust. She bakes the cut outs and uses them as chips. This makes it as close to pumpkin pie as you can get! I just made this dip for a Girl's Night In I hosted last week. It was different and so good. It was definitely a hit! I showed my pictures from the party, but I linked to this post to show your recipe for those interested. Thanks!! This dip is amazing!!! We served it with sliced apples, ginger snaps and graham crackers….must have for adults and kids alike! Hi everyone! Can someone tell me what 6 oz of yougart looks like please 🙂 maybe in tablespoons? My WW leader gave us a similar recipe served as a mousse. It calls for a package of vanilla sugar free instant pudding and no yogurt. Otherwise pretty much the same. Makes a great looking and tasting dessert. Yuck! It Looked amazing, but I was not a fan of the Greek Yogurt. Very bitter dip. Not sweet. Made this last night for the LSU-AL game (Geaux Tigers!) and it was a HUGE hit! Thanks! Hello from Colorado, I have made this recipe as part of a holiday potluck for work (a couple times) and my coworkers have RAVED about this recipe! I had about 15 people ask for the recipe at the latest potluck! It was an absolute hit, thank you so much for this healthy, light versatile recipe! My family appreciates it as well! Someone brought this dip to a Halloween Party with the apples to dip…it was fantastic!!! This recipe make a good amount of the dip…so the next day my nieces loved it! I will be making this again during the fall season! This probably would be a good topping on a cheesecake as well. Make this last night to snack on while the trick or treaters were coming and going… It was amazing and I didn't have the urge to munch on any of the candy I was handing out! Can you freeze the dip?